Globe patio light bulbs are one of the most iconic outdoor lighting options, seen in restaurants, event venues and residential areas across the world. 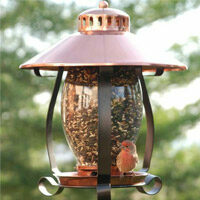 These versatile lights can be used to enhance the atmosphere in a variety of outdoor spaces and settings. 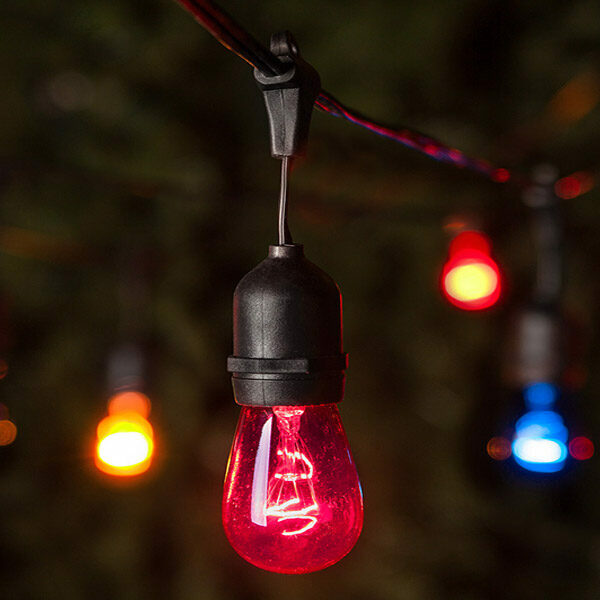 With so many options, we couldn't possibly name them all, so we've placed a few of our favorite globe light decorating ideas below to help inspire your own perfect outdoor setting! 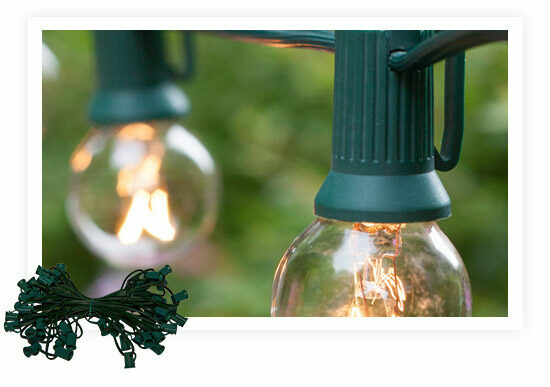 Hang globe lights above a backyard deck or outdoor patio. 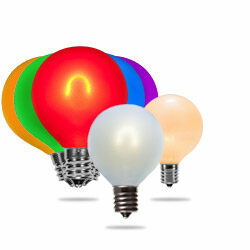 This is the most popular globe light application. You can affix posts to your deck or create your own DIY light poles to hang the lights from by using pvc or wooden poles, a sturdy bucket or container and cement. 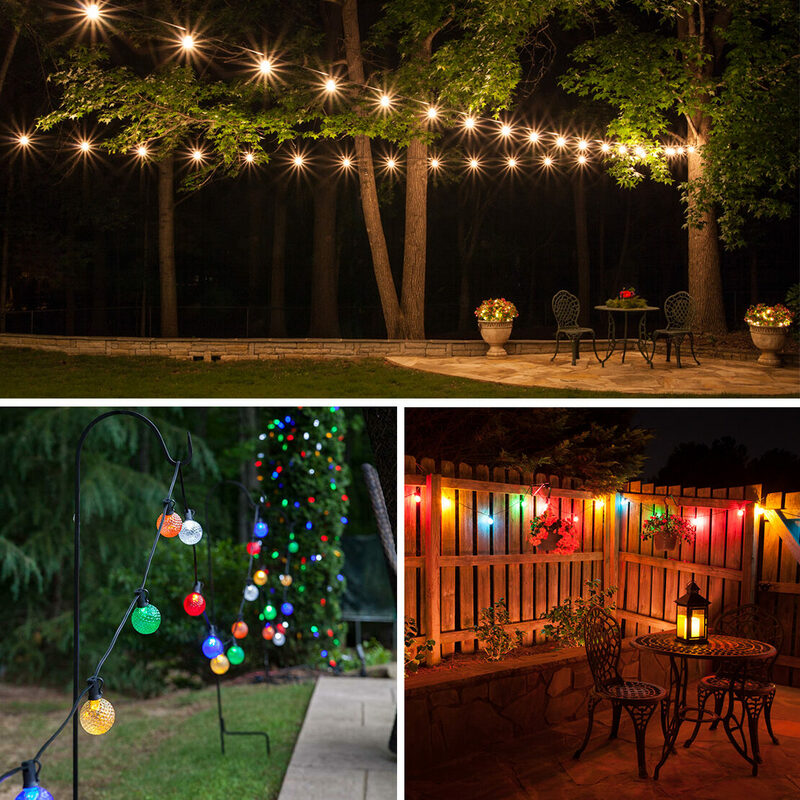 Create a glowing perimeter around your yard by draping globe lights along a fence, this is an easy idea with no extra poles or hanging surfaces required! 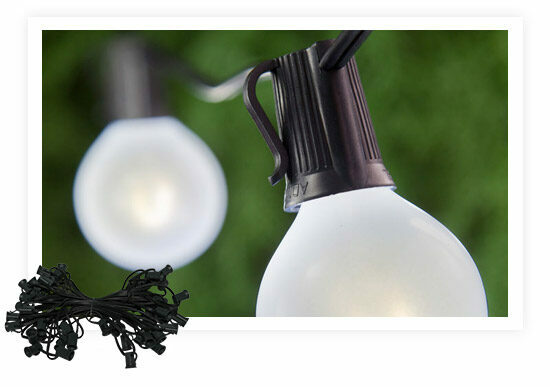 Hang globe light bulbs on shepherds hooks to frame an outdoor dining area, highlight contours & landscape features, or create an illuminated walkway. 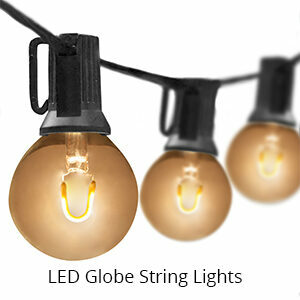 If you've been shopping around for globe patio lights recently you may have noticed that the bulbs are denoted by the letter G followed by a number, for example: G40, G95, G50. 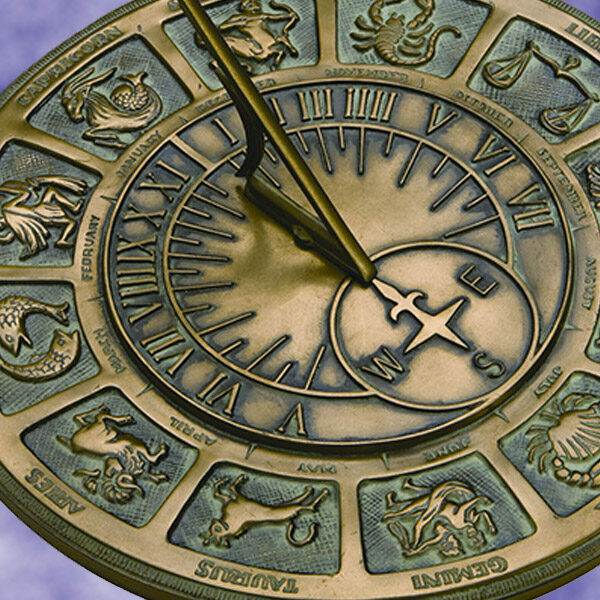 The number following the G refers to the diameter of the bulb in millimeters. So, a G30 bulb is 30mm around, a G40 is 40mm around, and so on. The larger the number, the bigger the bulb. Easy enough, right? To help with this visualization, we have provided a size comparison chart of the most common G bulb sizes below. 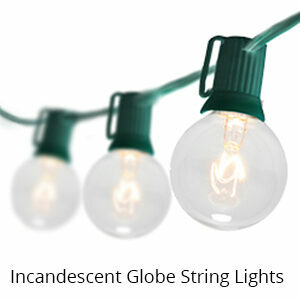 For more information on popular globe light sizes, visit our Globe Light Comparisons blog post. 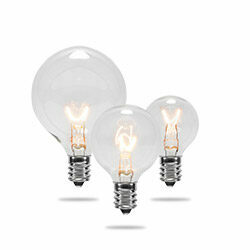 Which globe light size is right for your project? 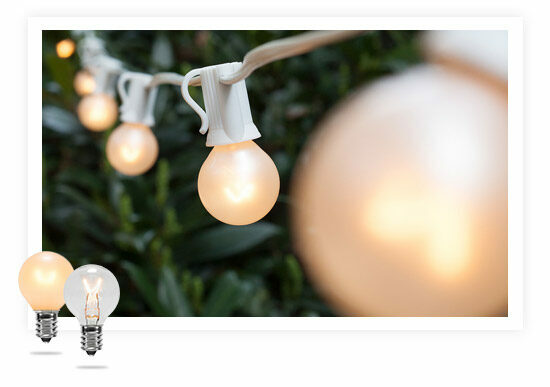 Small Space Lighting (apartments, small decks or patios, intimate events) - G30 bulbs are slightly larger than a standard gumball and G40 bulbs are the same size as ping pong balls; both are ideal for small space lighting. For the best light coverage and display, G30 & G40 globe light bulbs should be used on strings with no more than 12 inch socket spacing. 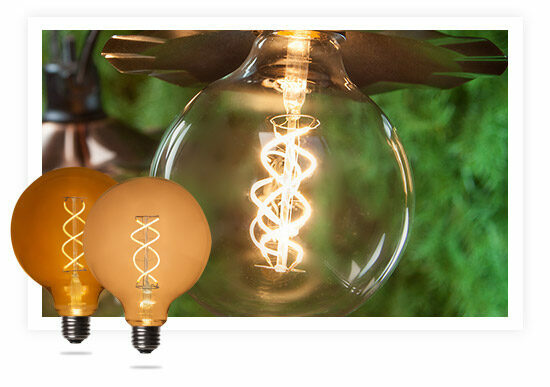 Large Space & Event Lighting (big backyard, fence lines, special events, restaurants, larger residential decks & patios) - The large bulb size and vivid light output makes larger globe light bulbs ideal for providing functional lighting for wide open outdoor spaces and long term projects including residential, commercial and event applications. 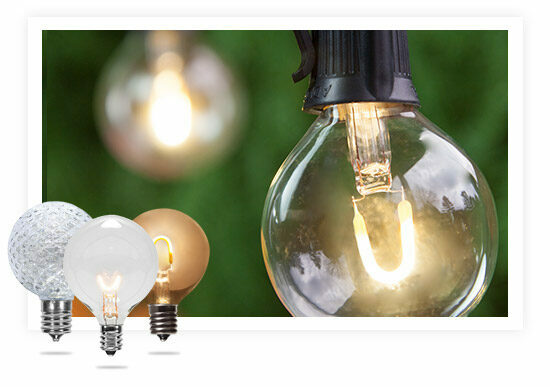 G50 bulbs are one of the most popular for large outdoor spaces, however G95 & G125 globe bulbs are an eye catching lighting solution, their large size means less bulbs are needed to make a great impact! G50 bulbs should be hung on light strings with at least 12 inches of space between each socket & G95 or G125 need even larger socket spacing between bulbs so as not to overpower the area being lit. 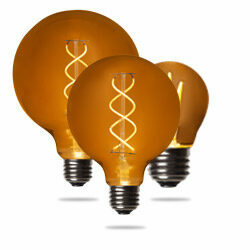 Bulb finish should also be taken into account when determining the best globe light bulb for your space. For example, clear transparent bulbs provide the brightest light output and can easily illuminate a large backyard or outdoor event space, whereas satin finish or faceted LED patio light bulbs diffuse the light to create a more intimate atmosphere. Clear/Transparent - This classic finish is the most popular of all! 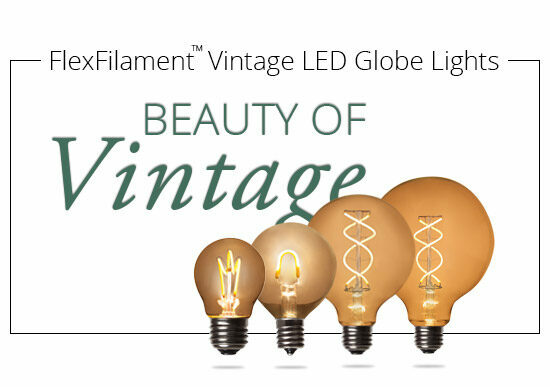 Transparent bulbs offer an unimpeded view of the interior bulb filament which makes them the brightest globe light option and provides complementary lighting in virtually any space. Satin Globe Lights - Featuring a diffused glow, satin finish and opaque globe lights create an intimate and elegant atmosphere at weddings, garden parties, and in any space where ambient lighting and sophisticated design are desired. 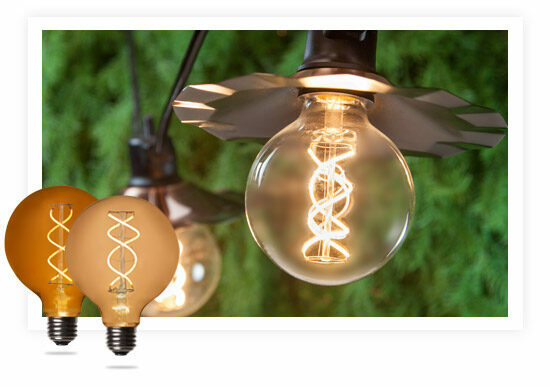 Mix and match bulb colors to create unique lighting themes for parties or hang all white opaque finish lights and let your existing decor take center stage. 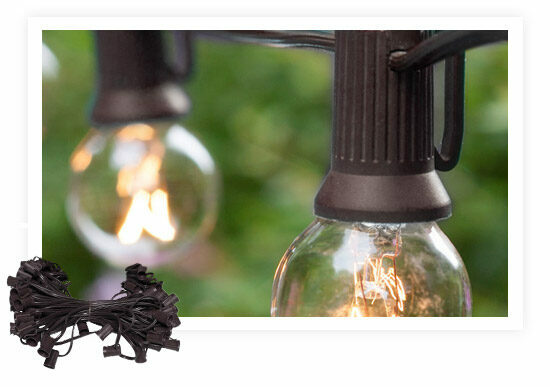 Bonus: Satin finish bulbs looks just as good during the day as they do at night! 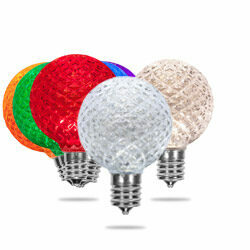 Faceted Globe Bulbs - LED globe lights designed with faceted lenses reflect a stunning light pattern when hung next to solid surfaces and are a fun and long lasting addition to any party or event. 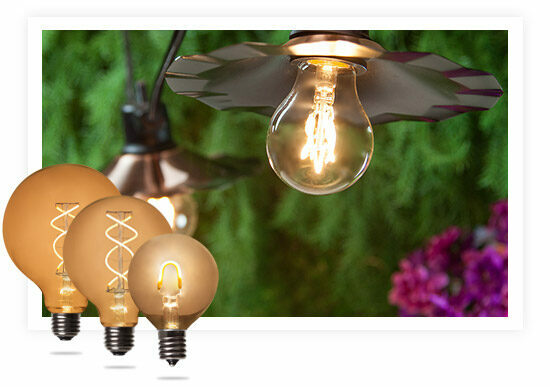 Antiqued Globe Lights - This gorgeous globe light finish is designed with a smoky antiqued glass lens, reminiscent of vintage Edison style bulbs. Which bulbs should you choose? 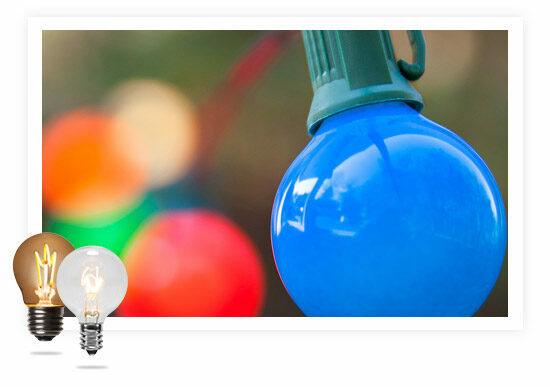 Because both bulb types are available in similar color and finish options, the choice between LED and Incandescent globe lights often comes down to budget, location and duration. 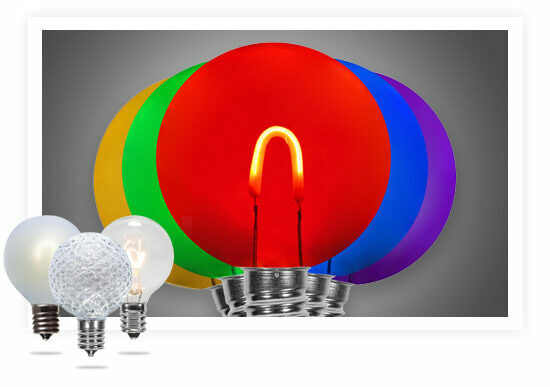 Incandescent globe light bulbs typically cost less than LED bulbs, however they require more energy and power to run; and because they are only available with glass lenses, incandescent globe lights are not as durable or ideal for long term use. However, if you're on a tight budget and looking to illuminate a small space for a short period of time, incandescent bulbs are a great option. On the other hand, for large space or long term lighting, LED globe light bulbs are incredibly long lasting, available in glass or durable acrylic lenses, and you can create longer continuous light runs without worrying about tripped breakers or burnt fuses. 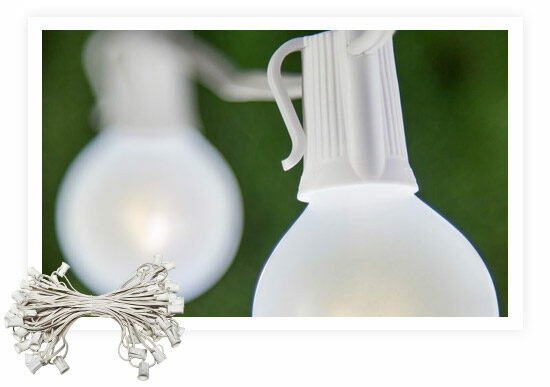 If you plan to keep your globe lights up for longer than a period of a few weeks and want to have a like-new outdoor light display year after year, the longevity and durability found in LED bulbs is often worth the initial extra cost.